As if Hamilton Dinger needs any more frustration at the moment. Not only has he accepted his duty as a Starlight defender, he's got swim meets to prepare for, his little brother to babysit, and an annoying new girl in his class. Plus he's got his 'mentor' dragon, Elysian, on his back every chance he gets, and his 'co-defender,' Starry Knight, urging him to quit the superhero business after every battle. As the Seven Deadly Sinisters and their leader, Orpheus, search for new ways to gather power, Ham finds both betrayal and friendship in unexpected places. Desperately searching for a way he can get stronger, he finds his own inner struggles costing him the most as he attempts to keep the rest of the city safe. Will Hamilton realize his potential in the power of trust? Will he be able make peace with Starry Knight, or will their quarrels be the downfall of them both? Great story. Love it. Good narrator and easy to follow. Clean adventure . Loved it. Don't miss this series !!!!! ANOTHER GREAT ADDITONS TO THE SERIES! THE SAGA CONTINUES, WHERE WILL IT LEAD? Would you consider the audio edition of Calling to be better than the print version? I have both, it would be close! This is better than book one! 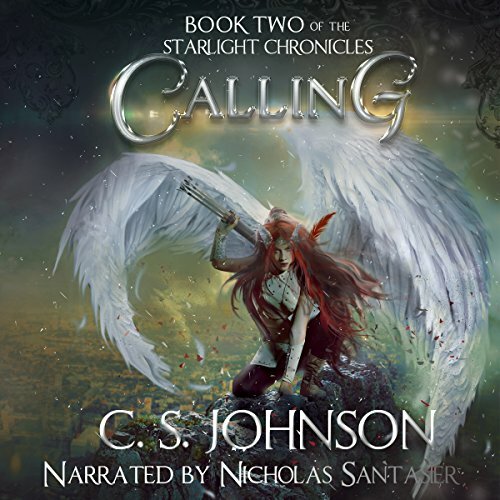 Calling (The Starlight Chronicles #2) by C.S. Johnson and narrated by Nicholas Santasier is an audible book I requested and the review is voluntary. I really liked the first book but the action hero part started at the very end of the book but this book started with the action hero stuff right away! Again this has the self centered Hamilton, full of himself, that has obtained his super powers, and has the help of a shifting dragon. He also has another sharp shooting pretty archer that thinks he is a menace to himself and mankind basically. Of course there are the arch villains! This is a fun book and I enjoyed it more than the first. The first book I enjoyed how full of himself Ham was but I thought teens would be the only ones enjoying the book. This book takes the book further and goes into super hero territory where those enjoying that genre will enjoy this book. It is also witty, snarky but fun, and lots of humor sprinkled through out. We get to see growth in Hamilton too. Learning to grow up a bit in many ways, subtle but he is getting there. Power didn't corrupt him like it might others. Of course he already thought he was next to God, lol. Fun book. The narrator was the same but his inflections were better in this book and seemed more in tune with the characters. I still think a different voice would be better but it worked.